Born in Nay-Kilye, Bessarabia. He studied in religious high schools in Kishinev and in Odessa, sustaining himself as an independent candidate who passed the sixth level of secular high school. He began publishing in Russian newspapers. His Yiddish debut in 1912 was in Gut morgn (Good morning) in Odessa; he published there a series of travelogues and stories. In 1914 he joined the Russian army of his own accord. Shortly before WWI broke out, he returned to Romania where he stayed until the annexation by Romania of Bessarabia. In 1923 he spent a short period of time in Argentina. At the invitation of Di prese (The press) in 1926, he settled in Buenos Aires. He was a contributor to: Rampa in Bucharest; Literarishe bleter (Literary leaves), Bikher-velt (Book world), Vokhnshrift (Weekly writings), Ekspres (Express), Haynt (Today), and Moment (Moment) in Warsaw; Parizer bleter (Parisian leaves); Tog (Day), Morgn-zhurnal (Morning journal), Forverts (Forward), Oyfkum (Awake), Tsukunft (Future), and Feder (Pen) in New York. He published articles, feature pieces, stories, travel impressions, theater and literary criticism, and fiction. Among his books: Nokh der forshtelung, groteskn un bilder funem yidishn aktyorn-lebn (After the performance, the grotesque and images from the life of a Yiddish actor) (Buenos Aires, 1928), 173 pp. ; Fun beyde zaytn yam: dertseylungen, groteskn un minyaturn (From both sides of the sea: stories, the grotesque, and miniatures) (Buenos Aires, 1928), 129 pp. ; Moyshe leyb halpern,…a kleyn krentsl oyf dem keyver fun a groysn dikhter (Moshe Leib Halpern,…a small gathering at the grave of a great poet) (Buenos Aires, 1932), 56 pp. 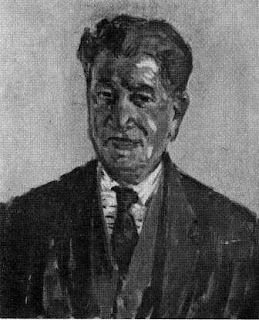 ; Portretn fun yidishe shrayber (Portraits of Yiddish writers) (Warsaw, 1933), 277 pp. ; Di lebnsgeshikhte fun a yidishn zhurnalist, memuarn (The life story of a Jewish journalist, memoirs) (Buenos Aires, 1942), vol. 1, 396 pp., vol. 2, 414 pp., vol. 3, 444 pp. ; Mir viln lebn, roman (We want to live, a novel) (Buenos Aires, 1944), 536 pp. ; Breyshis fun medines yisroel, reportazhn (The genesis of the state of Israel, reportage) (Buenos Aires, 1948), 2 vols., 538 pp. ; Mame yidish, eseyen un lektsyes (Mother Yiddish, essays and lectures) (Buenos Aires, 1949), 275 pp. ; Pshat, perushim oyf yidishe shrayber (Literal sense, commentaries on Yiddish writers) (Buenos Aires, 1952), 400 pp. Shabes, yontef un vokh in medines yisroel (Sabbath, holiday, and the week in the state of Israel) (Buenos Aires, 1958), 398 pp. ; D”r zhivago (Doctor Zhivago) (Buenos Aires, 1959), 43 pp. ; Di kenigin fun dorem-amerike (The queen of South America) (Buenos Aires, 1962), 338 pp. Plays for the theater: Hershl ostropolyer, tragikomedye in fir aktn mit an epilog (Hershl Ostropolier, a tragi-comedy in four acts with an epilogue) (Buenos Aires, 1928), 41 pp. ; Tsvishn tsvey revolutsyonern, R. ber lyoner, Hershl ostropolyer: dray drames (Between two revolutions, R. Ber Lyoner, Hershl Ostropolier: Three plays) (Buenos Aires, 1928), 186 pp. Together with Yankev Shteyberg, Botoshanski wrote a series of theatrical reviews which were staged in Bucharest in the years of and after WWI. Various Yiddish theater companies performed Hershl ostropolyer and R. ber lyoner in Soviet Russia, Cuba, Mexico, Australia, and Argentina. He served on the editorial board of Di prese. He helped edit four numbers of the anthology Likht (Light) (Iasi, 1915). He edited Veker (Alarm), a weekly in Brăila, Romania in 1916; and Oyfkum, a monthly journal, in Buenos Aires in 1927. His communal activities: in Odessa and later in Romania, he was close to the Zionists; after 1914, it was Poale-Tsiyon, later left Poale-Tsiyon; from 1922, he belonged to no single party and devoted himself in the main to Jewish cultural work. He was sent as a delegate to the YIVO convention in Vilna in 1926. In 1935 in Buenos Aires he was the initiator and inspiration for an energetic campaign against Temaim (Impurities); from 1951 chair of Yiddish writers’ association which bore the name of H. D. Nomberg in Buenos Aires. Among his pen names: Yankev ben Avrom, Yasha, Montshi, Hannah Levin, Yankele Gibalshs, S. Murdes, Shimele Soroker, Tsingenton. He was living in Buenos Aires. He occupied a conspicuous place in the field of literary criticism. Sources: Zalmen Reyzen, Leksikon, vol. 1; Z. Zilbertsvayg, Teater-leksikon, vol. 1; Algemayne entsiklopedye (General encyclopedia), vol. 5, p. 82; Yankev Glatshteyn, in Morgn-zhurnal (New York) (June 1929, June 1949); N. Mayzil, in Oyfkum (New York) (July-August 1934); Moyshe Shtarkman, in Tog (New York) (July 20, 1940); Melech Ravitsh, in Di prese (Buenos Aires) (April 3, 1945); Dr. A. Mukdoni, in Morgn-zhurnal (July 31, 1949); N. B. Minkov, in Tsukunft (January 1953); Shmuel Niger, in Tog morgn-zhurnal (December 20, 1953); Yankev botoshanski tsu zayne 60 yor (Jacob Botoshansky at age 60) (Buenos Aires, 1955), 96 pp.